This experiment is an accurate and simple study of Biot-Savart’s Law. Students measure the magnetic field of different diameter coils and show that the field at the center depends inversely with the radius of the coil. This device also enables students to measure the magnetic field of circular coils with different radii as a function of the distance. Uprights are mounted on a specially designed hexagonal optical bench with locking arrangements for precise positioning and smooth motion. Circular coils with different radii are mounted on the same upright, and each coil is easily changeable. An additional support at the center of optical bench prevents sagging. Accessories information: A constant current power source of 10 to 20A is required and available separately. 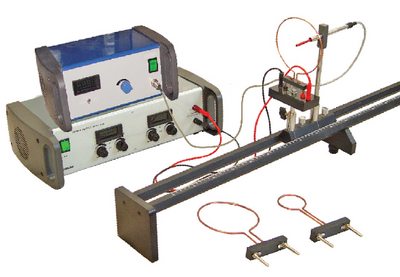 Ordering information: This kit includes a set of three circular wires with holders, a saddle, a Gauss meter with a hall probe, and an optical bench.